What is a mirror? Let’s check in a dream-book. Among many different associations we mostly pay attention to the following: smooth glass surface is a symbol of self-awareness, inner reflections and fears, also of entering the other mysterious side, the symbol of death, but also of trials of reconciling with your own identity. It’s not a coincidence that the latest album of Slovak band Ľahká Múza is entitled "To Be Your Mirror", and even more, in every single aspect the listener of this album experiences – in visual aspect, lyrical and even the touch – it is a perfect mirror. Ľahká Múza is a band which started its career thirty years ago being one of the pioneers of east European post punk and new wave scene. Soon, however, they created their own unique style mixing specific guitar darkwave sound with disturbing ritual atmosphere. They are so characteristic that so far there has been no other band able to imitate this trance shivering owned by the Slovaks. The fans had been waiting 9 years for the album released in September 2013 (meanwhile side project Hieros Gamos released the album which, however, didn’t include any new track). The question "was it worth it?" is this case is a faux pas. Gudrun and the others brought the best material they had ever released continuing the chosen music path. Simultaneously they increase the strength of expression as well as the satisfaction of the listeners. The concept of a mirror is realized in many different ways. It is a mysterious, beautiful and unusual thing. 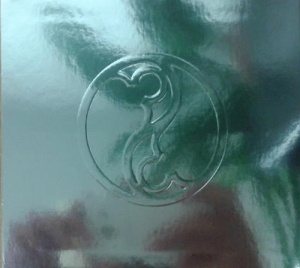 The album was released in silvery, mirrored digipack, cold and smooth like a mirror surface. The booklet is similar (PDF format) and finally the lyrics of the tracks (not only the title one) are full of references to water surface, the other side or the border. The lyrics along with the music take you precisely to the borders, to those perverse spaces, to deceitful fields where rendezvous of painful poetry and the pleasures of experiencing it is taking place. To the place, where the mass, the ceremony is taking place and the ghosts of memories dance with present reflections. And where you lay your head down to sleep and where the past is wide awake attacking the helpless knowing but none of the fair play rules. In terms of music, what the Slovaks offer is a mere hypnosis. Mesmeric rhythm, trance guitar sound, subtle details and synthesizer sound create the ideal of sound mysticism. Deep, powerful Gudrun singing, bringing to mind the ancient goddess (Gaja herself could be jealous of her) or mermaid danger, calls the demons of old illusions and experiences in the ritual of suffering and metamorphosis. What is significant is the fact that the vocalist uses her native language (however, the band takes care of foreign fans as there are translations in the booklet). Therefore, she expresses the emotions more freely – and the voice seems to be very susceptible to them. It hits strongly – making the trance effect and feelings condition deeper – sometimes it juxtaposes the anger and passion with delicacy as if it was fire and water. The very first notes of the introduction, slow "Evohe", make you forget about the reality. Hypnotizing, they make your hair stand on end and you do not notice any other impulse. It’s thanks to military rhythm, ephemeral guitars and powerful reaching the sky vocals. All those means become more intense in darker "Ako", riffs become harder, persistent monotonous rhythm is present in whole track, the atmosphere is intensified by the bass and subtle electronics. And the background is the anthem to irreversibility sung by Gudrun. The further we go the better it becomes. Most of the other tracks are pearls, each of them better than the previous one. "Hranica" balances between delicacy and heaviness, full of dark atmosphere it unifies trance-guitar moments and the contrasting parts using symphonic elements. Rhythmical bells are attracting attention and the piano makes the composition richer. "Príbeh o Anjelských Záhradách" is one of my favorite songs. If we translated the sounds into pictures, we would see the wide spaces of mystical garden full of scents of flowers hidden under dark leaves. They are evoked by the subtlety coexisting with powerful, deep vocalist’s voice. The piano motif is bound to melancholic vocals. The title track starts with dark electronics sounding like falling pieces of broken mirror. Changing dynamics and choral sounds of synthesizers in the background intensify the irresistible anxiety. A moment of rest is given to us by "Metamorfózy", lighter both in terms of slower rhythm and more melancholic, reflexive atmosphere (characteristic are also the lyrics in which there are more coming to terms with the faith). Military rhythm and guitar resembling the psychedelia of The Legendary Pink Dots create one of the best moments of this album. They also include industrial "Zlomený Kameň" which starts with sounds resembling hitting metal sheet. Heavy stanzas perfectly fit mysterious, hypnotizing parts becoming more and more industrial; this track stuck to my mind most after first listening to this album. In "Zlyhania" we have a chance to see a calmer side of the bad once again. Somnambulant new wave/darkwave loses delicacy in the explosion of pain in the finishing sharp vocals. "Keď Sny Kričali" fulfils mesmeric ideals, evoking in listeners almost cataleptic states. Drawing from old ethnic ritual "Naplnenie" again shows darker side with lots of suggestions created with contrasted vocals and monumental sound. When the last track "Symetria", full of melancholy and sadness, starts you begin to wake up. The album "To Be Your Mirror" is like opium imprisoning you in the cage of visions and reality and similarly to opium addict who doesn’t want to come back to reality, the listener doesn’t want to leave this music cage. So take the bottle of laudanum from the Slovaks hoping to get another delightful delirium. In the church of disappointed passions called Ľahká Múza a new homily was born and I’m paying the tribute to it.